Geoff De Weaver is super strategist who directs Fortune 500 clients to define their vision, create a strategy, and harness their internal innovation to grow their business or reinvent their products. Expert at building and transforming brands, businesses, and digital and physical customer experiences at scale. He excels at marketing, business development and growth, innovation, with ability to leverage cultural acumen. He helps B2B & B2C companies deliver business results, drive clarity and build sustainable business relationships across management levels, company cultures and geographic cultures. His experience is with clients from: Boards, C suite, EVP, SVP, VP and Heads of Innovation to think through and address problems, challenges, and opportunities to create and drive successful business growth. Expert at developing and executing cross-channel Global marketing campaigns/programs that drive brand positioning, equity and awareness while increasing engagement and sales. Geoff also focuses his efforts to create more meaningful outputs and clarity for his clients and brands. Importantly, a deep experience building brands and delivering business results through innovative use of media, creative, and technology. Since 1985, Geoff De Weaver and his team have partnered with Fortune 500 Brands, CEO’s or global marketers on five continents in the rapidly-changing media, digital, FMCG, retail, automotive, telecommunications, communications, financial services & entertainment industries. Including: Coca Cola, IBM, IMG, P&G, Microsoft, Nike, E*Trade, Nestle, Air France, AT&T, VISA, Unilever, EA.com, Ferrari, Acer Computers, BMW, ABC, BP Oil, The Walt Disney Co, Nike, Weight Watchers, Shutterfly.com, TiVo, DirecTV, EarthLink, Nissan, Pfizer, Gardens.com, Palm, XM Radio, eLuxury.com and more. I can infuse digital strategy and ideas deeply across all marketing channels with experience and skill. Experienced delivering: global campaigns, broadcast television, photography, videos, social, copy, guidelines, content, creative assets to regional and global teams. Ability to thrive in a fast-paced, results-oriented environment with an entrepreneurial growth mindset. Geoff is courageous, passionate about new ideas, innovation, new business, change, clarity and disruptive technology. He has worked with the world’s leading companies, helping them to design, create, engineer, and bring to market meaningful products and services. Additionally, he applies innovative thinking and a deep understanding to clients brands and business to ‘tailor’ programs that help them reach their goals, business objectives, drive meaningful engagements and get massive results! Geoff apply’s innovative thinking and a deep understanding of clients business to tailor programs that help them reach their goals and translate their brand’s unique value proposition into meaningful consumer engagements that drive results. Passionate and Influential marketer and innovation leader with 30+ years creating customers for global brands: IBM, AT&T, Microsoft, EA.com, Coca-Cola, Pepsi, P&G, Unilever, American Express, BMW, Gardens.com, Palm, XM Radio, eLuxury.com, etc. Geoff is expert at building and transforming brands, businesses, and digital and physical customer experiences at scale. History of success developing and executing cross-channel global marketing campaigns to drive brand positioning, equity, and awareness while increasing engagement and sales. Strong background in premium consulting sales, building initial and lasting impressions with clients by fostering productive relationships with executive decision makers to persuasively present optimized solutions that match the clients’ needs with available offerings and achieve account revenue goals. He empowers digital disruption, increases innovation and paradigm shifts by creating opportunities. He focuses on the latest ways to engage with people; build loyalty and trust, and enhance productivity and customer experiences. Geoff has the ability to analyze and glean insights from data. Geoff also has the experience to ensure a demonstrated ability to analyze needs and develop solutions that meet goals and budgets. He is also comfortable managing multiple projects nationally or globally simultaneously. He always strives to raise necessity, lift team performances and hit all deadlines and maximize standards. 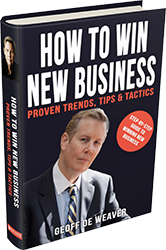 Over the last 30+ years, he has also directly advised hundreds of Fortune 500 brands and clients to generate billions of dollars in new business revenue and growth. Geoff has clients in the US, Asia, Australia Europe and all continents and regularly gets invitations and is retained by global Fortune 500 CEOs, Global Chief Marketing Officers, Board of Directors, best-selling authors, celebrities, Founders, VCs, world-class athletes, and entrepreneurs. Bottom-line, as a Digital Pioneer Marketing Expert and Rainmaker, Geoff brings over two decades of global digital experience as one of the most original and authentic strategists to offer breakthrough digital advise to Founders of a Series A start-up to a Multinational Fortune 100 company. His field-tested ideas, strategies make dreams come true for Fortune 100 companies and Unicorns today. Geoff strives to make a positive impact with all his work, always driving new business and gets ‘purpose’ coupled with clarity and necessity is the Millennial Magnet as they want to make a positive impact in the world today. Geoff’s experience ranges from San Francisco based “start-ups to” running companies with gross income of $65+ million, EBITA 23.2% and staffing in excess of 5,000 globally. Geoff has led and held senior roles in some of the most influential worldwide: Brand, Direct & Digital Agencies worldwide including: Ogilvy & Mather, Leo Burnett, Ammirati Puris Lintas, DDB, Agency.com, Direct Partners San Francisco (Omnicom) and others within the US and worldwide. Geoff has served as a non-executive director, director and advisory boards. Geoff is committed to never-ending, constant improvement, productivity, growth and new business drive. Geoff excels at executing strategic, cross-channel Global Marketing campaigns/programs that drive brand positioning, equity and awareness while increasing engagement and sales for iconic brands. Geoff delivers compelling client presentations and experiences, while clearly leading them through the creative process to overall success. Expert at Agency compensation negotiations – effective with 3 key approaches to negotiations: hard, soft and principled negotiations. Geoff is best know for helping global companies and leaders with their digital journey, branding, developing razor clarity, business development & transformation. I can help you optimize your new business strategy as well as help you outperform and outmaneuver any of your competitors. Especially helping you to meticulously, pinpoint the most qualified and best prospects, nationally or internationally. If you want to impact the real decision-makers – I can give you a competitive edge. Expert in understanding, evaluating and determining the role a brand in complex business situations such as: stock exchange listings, mergers, Internet commerce, acquisitions, spin-offs, deregulation, diversification, globalization and infusing digital strategies and ideas deeply across all marketing channels. I will help you design a comprehensive outreach and inbound campaign, access hard to reach brands and clients, fully examine and target your exact needs and requirements in all channels. I can even pitch on your behalf and happily be the extension to your company’s new business team.Because I excel at social media marketing, advanced analytics and database skills, I know the best channels to help you shape the most engaging discussions and messages. Importantly, having almost 30+ years of global results, I also provide deep industry landscape expertise. My commitment to helping you succeed far exceeds other business development consultants, PR Companies, list brokers, marketing consultants, etc. And, if required, I am also available to help you with face-to-face meetings, phone, Facetime or skype discussions. Geoff speaks to corporate and public audiences on the subjects of Personal, Professional, New Business and Growth Development, including the executives and staff of many of America’s largest corporations. If you’d like to generate more clarity, raise your necessity, have a digital transformation in your business and enjoy more sustainable growth, I’d like to share some of my career experiences with you. I’d also like to help you become more customer-centric and data driven while utilizing purposefully designed client/brand experiences. By sharing some of the experiences I’ve gained in working with corporate and brand leaders in global markets over the past couple of decades, I can help you define and transforms your business and help you take advantage of existing data-driven and creative marketing programs. As we work together you’ll be able to design ambitious, purpose focused campaigns, yet achievable strategic action plans to help you establish a new, or revitalize, an existing enterprise or company. And, build immense client loyalty. Since 1985, I have partnered with Fortune 500 Brands, CEO’s or global marketers on five continents in the rapidly-changing media, digital, FMCG, automotive, telecommunications, retail, communications, financial services & entertainment industries. Including: Coca Cola, IBM, IMG, P&G, Microsoft, Nike, E*Trade, Nestle, Air France, AT&T, VISA, Unilever, EA.com, Ferrari, Acer Computers, BMW, ABC, The Walt Disney Company, Nike, BP Oil, Weight Watchers, Shutterfly.com, DirecTV, XM Radio, Pfizer, Nissan and more. When you partner with me, you will get the most efficient, effective, and globally experienced digital transformation marketer or c-suite decison-maker . I can offer you three decades of results and success and love helping our clients do amazing things to grow their business. With over 30 years of global marketing and digital marketing leadership on some of the most iconic brands in the world; you will save time, money and ‘heart aches’ as I share with you, my extensive worldwide experience and relationships on Fortune 500 brands and start-ups. You will also, be able to share my passion, enthusiasm, and focus on serving my clients to help them step up and ‘pay it forward’. Geoff De Weaver International (GDI) is a leading agency global branding and new business consulting firm specializing in creative, data, technology and innovation. And, excels at finding solutions and influencing people. Geoff is the Chief Executive Officer of Geoff De Weaver International, and Business Growth Strategies, an Internet based company that helps businesses of all sizes increase their sales and profitability by implementing the best practices of top businesses and agencies worldwide. The firm focuses on helping ad agencies, digital agencies marketing companies, media firms, design firms, and public relations consultancies of all types grow and expand. The firm has been in business over 30 years of global expertise on numerous iconic worldwide brands. Geoff is a leading international expert on new business development, brand marketing, innovation, and growth. He has also directly assisted hundreds of Fortune 500 brands and clients generate billions in new business revenue and growth – from North America to Asia to Europe, South America and Australia/Oceania. Geoff De Weaver International (GDI), a privately held company, was founded by highly publicized thought leader Geoff DeWeaver®, for the purpose of helping Ad Agencies and businesses grow faster, better, smarter – and with more clarity! Geoff also pioneered the Internet Marketing Era in San Francisco in 1999 on clients like: EA.com, TiVo, E*Trade, Shutterfly.com, Webvan, DirecTv, XM Radio, Nissan, Pfizer, EarthLink, Palm, eLuxury.com and others for Omnicom (NYSE:OMC) He developed state-of-the-art analytic offerings, interactive and CRM solutions to numerous marketers. His digital career originally started in Westport, CT in 1985. We help Fortune 500 clients define their strategy, harness their internal innovation, grow their business or reinventing their products. We get results fast! We were also early pioneers in the digital and social worlds too. E.g. Pioneering Internet Marketing (Circa 1997) in Sydney, Australia followed by moving and launching Omnicom Groups (NYSE:OMC) first specialist digital agency in 1999. in San Francisco, USA. We excel at teaching teams how to think and influence in every role, challenge people to grow in character and contribution and act as role models to serve with integrity, heart and excellence. Help the senior leadership at our clients develop high performance habits, routines, campaigns and programs, coupled with best practice new business strategies that achieve steady increases in revenue, margins and market-share for years to follow. Make sure our clients have great chemistry, combined with clarity, necessity and productivity in all our procedures. Therefore, client churn is not a problem and, in fact, our firms become acknowledged as the ones to keep and build an elite level of trust and loyalty. Work with our clients to set up the best ways to have more clarity, have more courage, gain influence, manage people, policies and procedures so that profitability and revenues are achieved. And, all types of management concerns, such as structure, exit planning, and M&A initiatives, are dealt with effectively and efficiently. Importantly, we can greatly assist our clients if needed by developing an internal marketing and communication plan that helps staff members understand the firm’s direction and how to be part of its success. We develop ‘touchpoints’ to engage digital natives and fans with unique, personalized engaging interactive experiences on a global scale if required. We aid and assist a mix of business models to drive new revenue streams and find new ways to monetize content and build engaged and loyal fans. We specialize in optimizing operating models and delivering next-generation solutions on a retained or project basis. We aim to make our clients and brands excel in the rapidly transforming and shifting digital ecosystem. We are Paradigm Shifters and excel at building customer acquisition and retention strategies for the twenty-first century. Worldwide expertise in: Growth, Strategic Planning, New Business Development and overseeing: Account Management, Creative and Media Teams globally, penetrating new markets, negotiating worldwide media and creative/production contracts, developing Internet strategy, recruiting and training new staff, building and fostering a strong culture and holding complete worldwide profit and loss (P&L) responsibility. Geoff is the president of Geoff De Weaver International, and Business Growth Strategies, an Internet based company that helps businesses of all sizes increase their sales and profitability by implementing the best practices of top businesses and agencies worldwide. Drives the executive vision of a company that has represented Fortune 500 brands, CEO’s and global marketers on five continents across a variety of dynamic industries. He speaks to corporate and public audiences on the subjects of Personal, Professional, Innovation, New Business and Growth Development, including the executives and staff of many of America’s largest corporations. His passionate talks and seminars on Agency Growth, Leadership, High Performance, Goals, Strategy, Creativity and Success Psychology bring about immediate changes and long-term results.